We're expecting a bit of a drop-off in the number of freeware releases in the run-up to Christmas, but for now, they continue to mount up. Preamps, compressors and circuit-bent toys - you'll find them all and more besides if you read on. 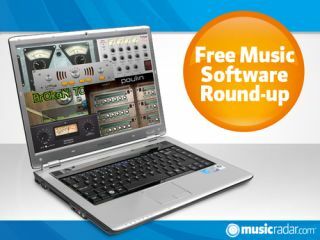 If you've got a new free music software release, make sure you let us know about it by emailing musicradar.pressreleases@futurenet.com with all the details. A 4-band compressor that can operate either in the traditional way or Comp4's side-chaining mode. You get a Pre-gain/Gain control and analogue-style meter for each band and a mix control for parallel compression. Plektron says that Comp4 is suitable for use on all types of material and either on individual channels or the master channel. This vintage-style preamp is powered by Acustica's Nebula technology and is designed to add warmth to the likes of guitar and drum tracks. The developer says that we can look forward to more plug-ins derived from Nebula in the future. This successor to LeCab (you guessed that, right?) is an Impulse Response loader that's specifically designed to emulate guitar and bass cabs (longer Impulses can be loaded but they'll be truncated). We should also tell you that LePou's LeCto amp sim is now available in Mac format. We're guessing that you need a bit of warming up at the moment, but spare a thought for your music, too. Lil'Plug gives you subtle drive combined with some "smooth EQ", and there's also an Overdrive setting should you wish to take things a bit further. Low and High Boost buttons are onboard too. This sample-based instrument came about when the developer circuit-bent an old toy and decided that he wanted to share the result of his tinkering with the wider freeware loving world. Necromare has a few other weird and wonderful VST instruments on its site, too, so check 'em out.